The Whitehall Village Board’s decision to host a special meeting regarding a prospective pig farm may have caught many unawares but none more so than the owner of the farm, Jon Ingerson. “I had no clue you can’t have pigs here,” Ingerson said. Ingerson is a long-time native with family roots which “go back 50 years” and himself a graduate of Whitehall Central School. He resides in Dresden where he operates Windy Meadows LLC and has been raising pigs for five years. “I’m just trying to expand my operation,” he said. That’s why he selected “the Old Lane Farm,” situated on State Route 22 on the northern edge of village limits. It seemed a perfect fit for his burgeoning swine business – there were already barns in place and the farm was a well-known dairy farm since 1949 and even when Lane died in 2008 the farm still maintained “16-18 hogs, goats, sheep and angus cows” until 2014, Ingerson said. “They had quite the operation at some point,” he added. 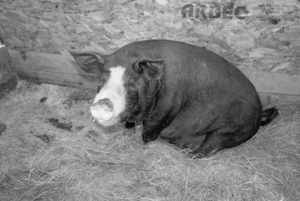 Being that the property has a history of farming, Ingerson figured it to be the ideal site for his pigs. It wasn’t until he actually moved his stock onsite that he learned otherwise.